japanese, miniatures, miniature, dollhouse, toys, glico, time slip, show period, cash register, till, dagashiya, candy, shop, retro, games. YOU WILL ONLY RECEIVE NEW ITEMS WITH A BOX. THE OUTER CARDBOARD BOX HAS HANDLING WEAR. THE PIECES ARE NOT IN THE ORIGINAL SEALED PLASTIC PACKAGING. 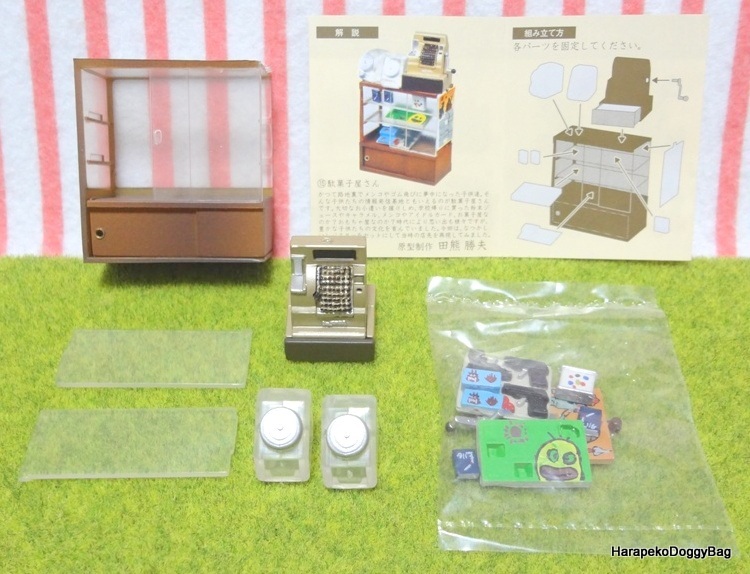 Here is a miniature retro Japanese snack shop or "dagashi-ya" shelf and cash register set. The register till is movable. The set includes plastic pieces that have to be assembled. Keywords: japanese, miniatures, miniature, dollhouse, toys, glico, time slip, show period, cash register, till, dagashiya, candy, shop, retro, games. Below is a sample photo of the set with the info card.